The Norfolk & Norwich Millennium Library, which Hopkins designed as part of our Forum project, has been named the UK's most popular library with over 1.3 million visits in the year. 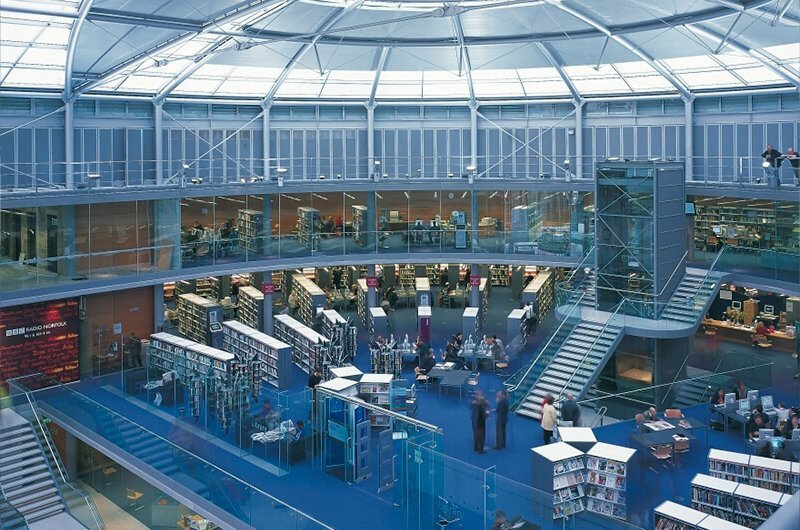 2013 marks the 7th year in a row in which the library has received this accolade, with the facility attracting 31% more visitors than the next most popular library. The Forum was built in 1994 and was conceived as an information hub, with a large enclosed atrium surrounded by a three storey enclosure which accommodates the Library together with visitor and business centres, a bar and restaurant, and studios for the local BBC station on a series of open balconies. The atrium's roof is supported by bow-string steel trusses forming leaf shaped panels, infilled with acoustically absorbent material or glazing that allows abundant light to enter into heart of the building, creating a dynamic public space that remains a focal point for community activity.